The GDA Diet is the diet for everyone. It is the first and only diet to use the Guideline Daily Amounts (GDAs) food labelling system which has been adopted by leading brands throughout the UK. The GDA Diet is the key to losing weight and keeping it off! It's simple to follow and doesn't involve complicated recipes or fancy foods; in fact it incorporates the everyday products - including ready meals - you'll find in the supermarket. Nothing is banned or off limits, allowing you to eat the foods you love while staying nutritionally balanced and making more informed choices about what you eat. 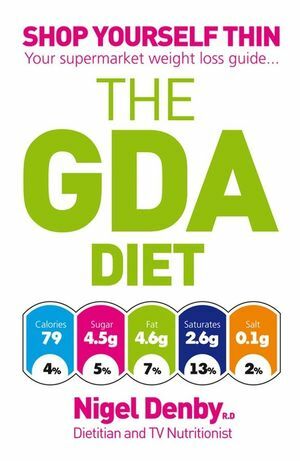 The GDA Diet has been compiled from over 20,000 supermarket products, making it the most comprehensive and varied diet ever! It is full of tips for real people, living busy lives with recommendations for people on budgets, the time pressed and vegetarians, so there are really no more excuses not to eat well and be healthy. Follow the simple guidelines in this diet and you'll confidently be able to break free from the 'yo-yo diet cycle.' This is your passport to a lifetime of permanent weight control and better health. Nigel Denby is a registered dietitian. He trained at Glasgow Caledonian University, following an established career in the catering industry. He combines his dietetic training with a love of food – he is a trained chef and restaurateur – and has recently opened a parent/child community website www.grub4life.org.uk , which provides support, information, recipes and advice to parents and teachers of young children. He runs a practice in Harley Street where he specialises in weight management, PMS, the menopause, Irritable Bowel Syndrome (IBS) and food intolerance. As a broadcaster for television and radio in the UK and across Europe, Nigel is a familiar face on programmes such as The One Show (BBC1), Teen Mums and Kyle ’ s Academy (ITV1) and The Truth about Food (BBC2), and he has appeared on BBC Breakfast on numerous occasions. He writes for the Sunday Telegraph Magazine, Zest, Essentials and Somerfi eld Magazine . Nigel is also the nutritionist for www.closerdiets.com , a member of the expert panel for the ‘Nutrition and Health Show ’ and consumer dietetic adviser for Complete Nutrition magazine. He is the author and co - author of seven books including Nutrition for Dummies, The GL Diet for Dummies and Living Gluten Free for Dummies . In 2006 the Food Standards Agency DVD Eatwell featuring Nigel won a Silver Screen award at the US International Film and Video awards. 1 THE GDA DIET – THE DIET FOR EVERYONE. 2 CHECK, COMPARE AND CHOOSE. 3 HOW TO READ YOUR GDA LABELS. PART II: YOUR GDA LIFESTYLE. 4 GDAs AND YOUR HEALTH. 5 CALORIES, SUGARS, FATS, SATS, SALT – AND YOU! 6 IT’S ALL IN THE PLANNING. 7 GOAL SETTING AND GETTING STARTED. PART III: THE GDA DIET. 8 THE GDA DIET 7-DAY EATING PLANS. The 7-day plan for busy people. The 7-day plan for vegetarians. The 7-day plan on a budget. 9 THE GDA DIET TOP TIPS.